Bloom's Taxonomy—How to Make Your Studying Perfect? Bloom’s taxonomy is a set of hierarchical models that classify educational learning objectives. It divides them into levels that differ in their specificity and complexity. This article will give you clear understanding of how to ace your studies. 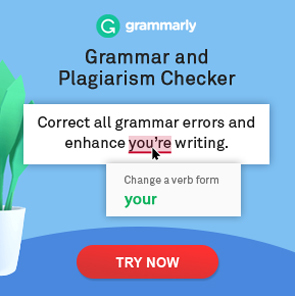 By the way, if you’re struggling with your assignments and type into Google “write my essay online,” simply turn to us and get A+ grades! Bloom taxonomy got its name from Benjamin Bloom. He was the head of the educators’ committee that devised the taxonomy. Bloom was also an editor of Taxonomy of Educational Objectives: The Classification of Educational Goals, a standard text that was published after a series of conferences between 1949 and 1953. The purpose of those conferences was to improve the way educators communicate regarding the design of curricula and examinations. There were 2 volumes of taxonomy. The first volume was released in 1956 and it was titled Handbook I: Cognitive. The second volume, titled Handbook II: Affective, was published in 1964. The whole taxonomy consists of 3 domains: cognitive, affective, and sensory (also known as the psychomotor domain). The cognitive domain attracts the most attention from educators. The main focus is to use it as a core to structure curriculum learning activities, objectives, and assessments. In 2001, a revised version of Bloom’s taxonomy’s cognitive domain was published. It was Lorin Anderson, a former student of Benjamin Bloom, who led an assembly in the 1990s. The aim was to update the taxonomy and make it more relevant for teachers and students in the 21st century. In the chart below, you can see the cognitive domain of Bloom’s revised taxonomy in its entirety. It consists of 2 main dimensions: cognitive processes dimension (levels of the taxonomy) and knowledge dimension (you can find explanations for each type of knowledge after the chart). In the chart, there’s also a description for each level, verbs that represent a certain level in the knowledge dimension, and examples of how a particular level can be implemented in real life. Originally, this taxonomy consisted of one dimension only (levels, or cognitive processes). Bloom’s revised taxonomy brought in the knowledge dimension that shows the kind of knowledge to be learned. Factual knowledge. These are the basic elements. Every student should know them in order to be properly acquainted with a certain discipline. And to solve any problems it might have. Factual knowledge includes knowledge of terminology, specific elements, and details (technical vocabularies, major resources, symbols, etc.). Conceptual knowledge. Conceptual knowledge represents the understanding of relations between the basic elements inside a bigger structure. And how these relations enable the elements to function as a whole. This set includes knowledge of models, structures and theories, generalizations, principles, categories, and classifications (historical periods, theorems, laws, etc.). Procedural knowledge. This is the knowledge of certain processes and steps to do certain things and complete specific tasks. It also involves methods of inquiry and criteria for using skills, methods, and techniques. This category includes knowledge of when to use certain procedures, knowledge of methods and techniques specifically for the subject, and knowledge of algorithms and skills common for the subject (painting, number division, techniques of interviewing, methods of scientific experiments, etc.). Metacognitive knowledge. This is the general knowledge of cognition. It also involves the awareness and knowledge of your own cognition. Knowledge that belongs to metacognitive knowledge includes strategic knowledge, cognitive tasks (including conditional and contextual knowledge), and self-knowledge (outlining to capture the structure of a subject, knowledge of test types, awareness of personal strengths and weaknesses). 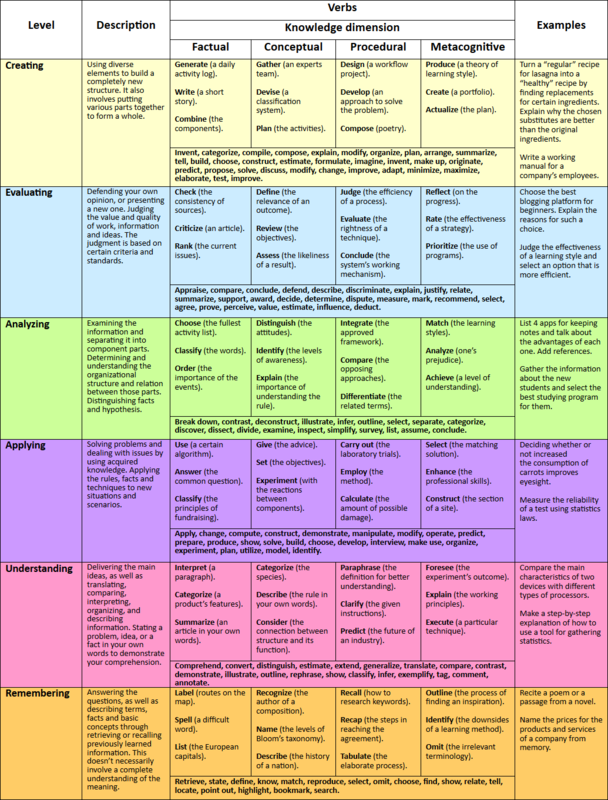 Bloom’s taxonomy provides a systematic classification of the learning and thinking process. Its framework is straightforward and easy to understand. When used right, Bloom’s taxonomy not only acts as a great tool for measuring thinking, but it also fits the needs of modern educators and provides an alignment between educational standards, objectives, activities, goals, and products. This alignment makes it easier for teachers to decide how to use the time in class effectively. If we’re talking about students, Bloom’s taxonomy also comes in handy. It can help to develop a more systematic approach to studying. This approach, in turn, will bring positive results much quicker, because there will be specific objectives to work towards and a straight route to reach them. Here’s an example of how you can use Bloom’s taxonomy in a complex, using all of its levels. We’ll use the tale “The Three Little Pigs” as the subject. Remembering. Describe the place where the pigs lived. Understanding. Summarize the story of the three little pigs. Applying. Build a theory of why only the third pig decided to build a brick house. Analyze. Outline the actions of the pigs. And decide how you would act in the same events. Evaluating. Assess what would happen if the three little pigs acted differently. Creating. Write a poem, song, or skit to describe the whole story in a new form. It’s possible to apply Bloom’s taxonomy to a much wider variety of scenarios and situations. Apart from studying, it finds use in numerous types of training and preparation, including medical training. Bloom’s taxonomy provides a well-organized framework that every teacher, tutor, and trainer needs to provide an efficient learning process. Students can also use it to improve their performance greatly. If that’s what you need, then it’s worth giving this system a shot. Interview with Ingrid Mosquera Gende: How to make the most of your studying? Thanks for the link to this article. Very informative. Love in the info and the graphics.